Now I have to try and remember every clever little thing I wrote yesterday about this post. Blogger has not let me down before so I can't really complain. 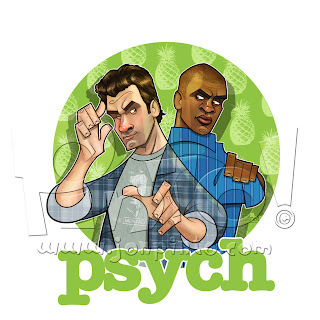 Psych is one of my all-time favorite shows and I have had a sketch of this in my book for a really long time. I don't know why it's taken so long to get down to finishing it. Oh yeah! I get distracted pretty easy. Oh look! Shiny keys!! So anyway, here is a Psych drawing, the sketch and the video of the progression. I am really having fun making those! And here is a bonus. I accidentally turned off the line work layer and kind of liked what I was left with. What do you think? ?